Interested in putting your design skills to the test? 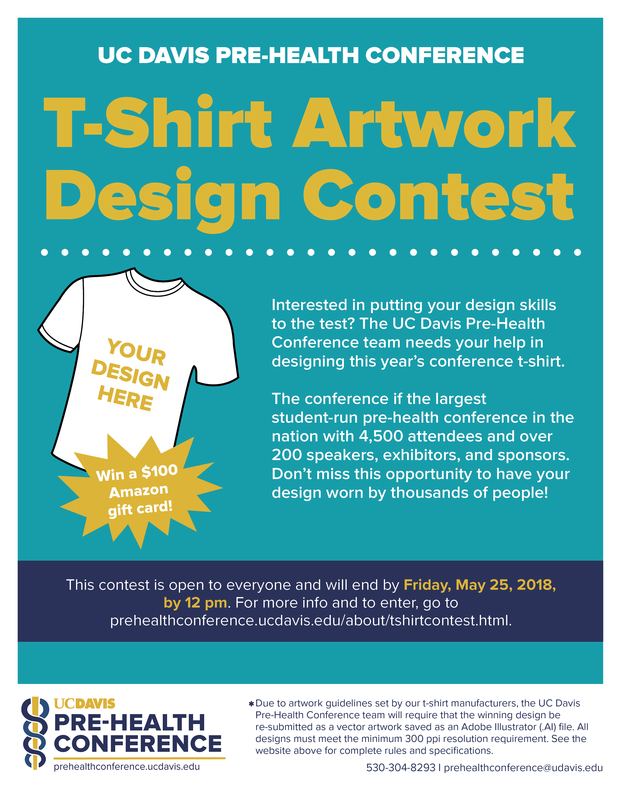 The UC Davis Pre-Health Conference needs your help in designing this year’s conference t-shirt. The conference if the largest student-run pre-health conference in the nation with 4,500 attendees and over 200 speakers, exhibitors, and sponsors (e.g., The Princeton Review, Kaplan, US Army, UC Air Force, etc.). This is your chance to get your artwork out there to be worn by 4,500 attendees and to win a $100 Amazon gift card prize. Don't miss this opportunity to build your portfolio and get your design out there! Submissions must be uploaded before 12 p.m. on Friday, May 25, 2018. Individuals will be notified about the results upon selection of their artwork by the end of May. 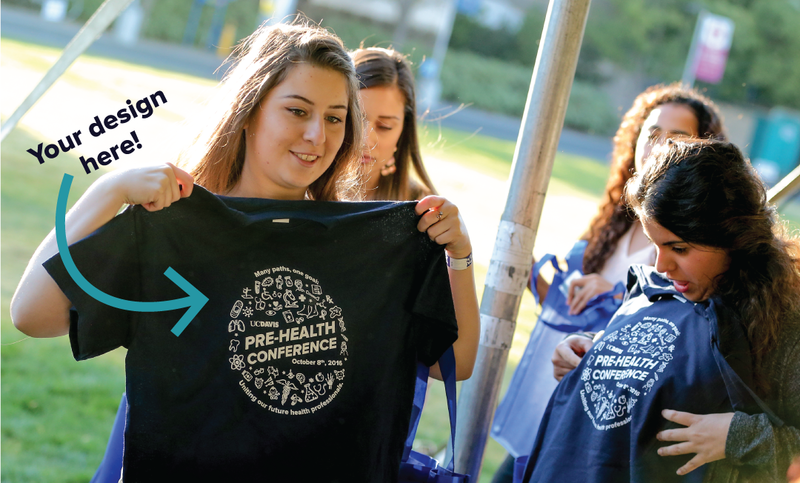 The theme for this year's conference is "Part of Your Journey," suggesting that the UC Davis Pre-Health Conference is a source of knowledge and resources for students as they navigate their journey towards their future health career. The theme lends itself to travel-themed ideas and visuals, such as signs, roadways, passports, and the globe. Have fun and be creative as you design your artwork. Designs and/or concepts will need to be inclusive of all health professions and allied health fields (e.g., medicine, pharmacy, occupational therapy, nursing, veterinary medicine, dentistry, etc. ), representing them equally if included. Design must include the Pre-Health Conference Logo and the 2018 theme: Part of Your Journey. Please email prehealthconference@ucdavis.edu to obtain the Conference logo. Design must be one (1) color on one (1) location of a unisex t-shirt and meet the below specifications. Note: Submitting parties must ensure that the design, artwork, and all supporting components submitted is of their own design. Fraudulent submissions will not be accepted and submission party information will be given to Student Judicial Affairs at the discretion of the UC Davis Pre-Health Conference and/or Health Professions Advising. *After selection, a vector artwork must be saved and submitted as an Adobe Illustrator (.ai) file as required by our T-shirt manufacturers for printing and production. Please see our Terms and Conditions for further information. All submissions must meet the above specifications and submitted as an image format (e.g., jpeg, png, pdf, tiff) for initial review. Submissions must remain below 10 MB to be considered. Upon selection by the UC Davis Pre-Health Conference team, you will need to submit the source file such that the vector artwork is saved and submitted as an Adobe Illustrator (.ai) file for printing as required by our T-shirt manufacturers. UC Davis Pre-Health Conference reserves the right to make necessary modifications to the submitted artwork in order to meet printing requirements. Upon entering the UC Davis Pre-Health Conference T-Shirt Design Contest, submitting party agrees to relinquish all ownership of their submission to University of California, Davis Health Professions Advising and the UC Davis Pre-Health Conference. Submitting party may retain original files for use in their personal portfolio. We reserve the right to use the selected design for current and/or future use in T-shirt production, program design, and marketing/presentation materials. Submitting parties must ensure that the design, artwork, and all supporting components submitted is of their own design and that they have the sole right of use. Fraudulent submissions will not be accepted and submission party information will be given to Student Judicial Affairs at the discretion of the UC Davis Pre-Health Conference and/or Health Professions Advising.